CATONSVILLE, Md. — If all you know about UMBC — the ultimate March Madness Cinderella that became the first ever 16-seed to beat a 1-seed — is that they blew out Virginia, then you don’t really know their story at all. 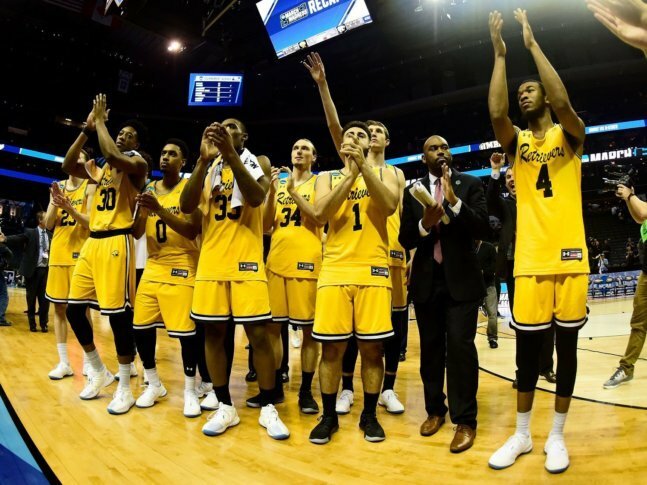 Everything that made the Retrievers’ moment something greater than just the most spectacular upset of all time happened between the space of two buzzer-beaters, earned at the ends of two disparate, winding paths to Catonsville. You’re forgiven for being thrown by the jerseys, or the Dog Rates tweet, but UMBC’s mascot is not a golden retriever — it’s a Chesapeake Bay retriever. The state dog of Maryland, the breed is a popular hunting dog in the mid-Atlantic, with a thick brown double coat and golden eyes, known for its intelligence. For a school whose crowning “athletic” achievement before last week was a national chess championship, it’s only fitting that they’re known colloquially as Chessies. As you know by now, UMBC’s campus is conveniently located just outside of Baltimore. That’s an inside joke around the university, but practically it means that the entrance to campus is essentially the continuation of a highway off-ramp, just on the other side of Interstate 95 from BWI Marshall Airport. On Tuesday, the conquering heroes returned home to the hilltop for a proper celebration. Their whirlwind 48 hours had ended nine days before, with their elimination on the first Sunday of the NCAA Tournament; but that led immediately into the school’s spring break. While the rest of the nation rambled on, clinging to Sister Jean and Loyola-Chicago’s Final Four bandwagon, the Retrievers got some much-needed rest. Even so, even now, on a gray, drizzly afternoon, it all still seems like some kind of dream. The only indications on campus that anything special is happening are the B’More Greek food truck pulling into the front drive of the sparkling new events center and a handful of “basketball celebration” signs directing traffic to specific parking lots around the hilltop. That’s the new, $85-million event center, which didn’t take the most unlikely upset in college basketball history to build because it was already in place, doors opened six weeks before the game ever happened. It’s emblematic of the way that this long-overlooked school managed to be the only one prepared for what happened this March. The first buzzer-beater you probably missed. It happened on a frigid Saturday morning in front of a stunned, hostile crowd at Roy L. Patrick Gymnasium in Burlington, Vermont. The America East Championship was broadcast nationally on ESPN, but with an awkward 11 a.m. tip. Unlike larger conferences, whose tournaments are consecutive, multiday affairs at neutral sites, the higher seed gets to host in the America East. That meant two-seed UMBC had to commute 13 hours through a nor’easter, all the way to within 30 miles of the Canadian border. Vermont had swept both meetings with the Retrievers during the regular season by a combined 43 points, including an 81-53 stomping on UMBC’s brand-new home floor, the first game inside their new arena. They were a legitimate threat themselves to be a March Madness Cinderella, having taken Kentucky to the wire at Rupp Arena in the first game of the season. The Catamounts led for 34 minutes, but UMBC got a crucial replay reversal in the final two minutes that led to the game-tying bucket. The Retrievers got a stop. Then, without taking a timeout, head coach Ryan Odom left the game the hands of his graduate senior point guard, Jairus Lyles. He was never giving it up. After a crossover to his left to create space, Lyles pulled the trigger from the top of the key, his season, his particular, circuitous path through the multiverse of possible college basketball careers that had led him north through the snow and through much more existential obstacles to this point all on the line, the ball finding nothing but the bottom of the net. “That’s a shot I’ve been working on all season,” Lyles explained on camera after the game. It’s the moment he had been working toward for much longer than that, though. Lyles was a standout at DeMatha Catholic in Hyattsville, eventually matriculating to VCU, the most recent local team to make a memorable March run with their Final Four appearance in 2011. It turned out not to be the right fit, so he transferred to Robert Morris, but didn’t even last the semester there. A once-promising college career suddenly looked bleak. He had only one more chance to get it right, but he needed somewhere to take a chance on him. The Silver Spring, Maryland, native scored 23 points per game in 2015-16, his first season as a Retriever, becoming the face of the program just as Odom arrived on campus. Despite graduating last year, Lyles still had his final year of eligibility remaining and chose to stay this season while he took graduate classes. And after scoring just eight points in the first matchup with Vermont, he poured in 27 in each of the next two, including that career-defining three-pointer. 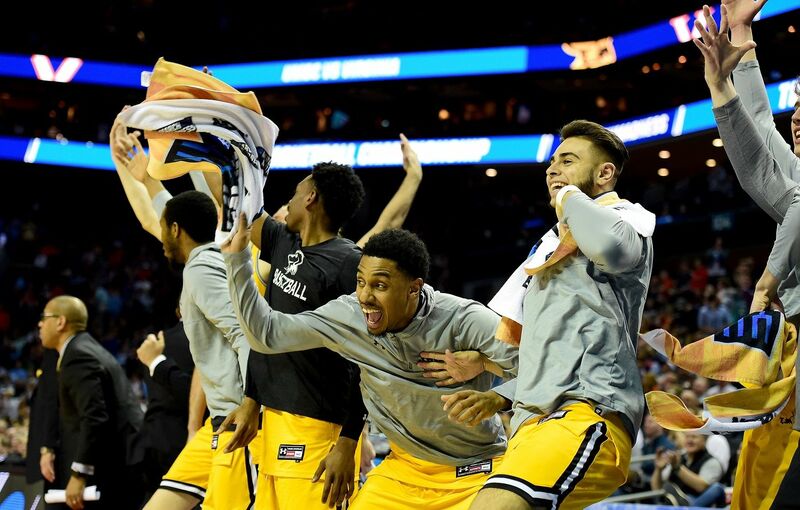 UMBC’s stunner earned the Retrievers their history-making date with Virginia, maybe the perfect opponent, if there can be such a thing, as a 16-seed. Every year, the NCAA Tournament selection committee just so happens to litter the bracket with less-than-random seeming matchups and possibilities. So while Virginia may not have thought too hard about which 16-seed the Cavaliers would draw, when UMBC saw UVA revealed as its opponent, head coach Ryan Odom found himself coaching against his own history. His father Dave was an assistant coach in Charlottesville for eight formative years of Ryan’s life, during which he served as a ball boy. It was also where both of Lyles’ parents went to school. Coincidence, surely. You know what happened next. UMBC and Virginia slogged through an ugly half of basketball, as Virginia is wont to do. But then, in the second half, when the Cavaliers normally impose their will and break their opponent down, instead the opposite happened. The Retrievers flipped the script and shattered the vaunted pack line defense, running the Sharpied-to-advance top seed off the floor. It was clear this win was different from anything that had happened before, the kind of upset that is commonly thought of as impossible until it happens. One of the newer March Madness traditions involves the winning team placing the sticker with their team name on a giant bracket in the locker room, officially marking their progression to the next round. Even as UMBC advanced itself on the bracket, with one emphatic slap from Lyles, the sticker bearing the school name went on with a crease, a wrinkle that made it stand out from the rest. Everything was a whirlwind after that. Countless interviews, following a game that didn’t end until around midnight, stretching the night into the wee hours of Saturday. Steph Curry posting about Lyles and the team on Instagram (“And then he tagged me, and then he followed me, which was even cooler”), eventually working with Under Armour to send them all new shoes for the next game against Kansas State. Just as it had the right players on the floor and the right coach to lead them, UMBC also had the right guy at the helm of the team’s most immediate connection to the outside world, its Twitter account. Zach Seidel grew up just miles from campus in Pikesville, both his parents alumni of the school. He’s been involved with the university since working as an intern as a senior in high school back in 2008. The first game he ever worked, UMBC won on a buzzer-beater. Seidel’s brand of pushing the limit and not being afraid to be brash fit the tone of a team ready to pull off the unthinkable. Maybe, steeped in the history and the present of the school, he knew something everyone else didn’t, or maybe it just looked that way from the outside. After all, 2008 the last time the school had made the NCAA Tournament before this March. 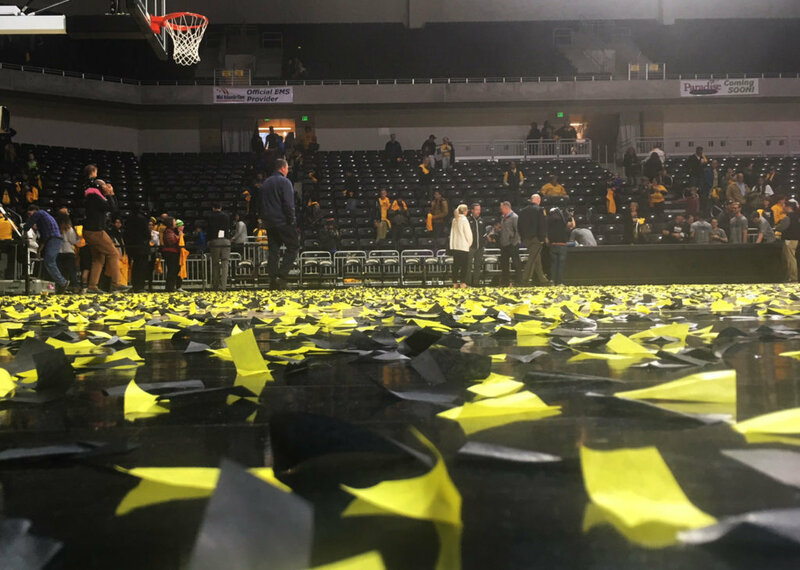 It was also the last time the Retrievers had beaten Vermont, a string of 23 straight losses before Lyles’ game-winning, Championship-sealing bucket. Oh, right, there was another game to play, against Kansas State, less than 48 hours after UMBC had upended order in college basketball. It might have been the only part of the whole thing for which they weren’t prepared. Still, the Retrievers got off to a good start. But they just couldn’t get shots to fall. They hung around, and hung around, and hung around, but couldn’t break through. Incredibly, UMBC had 17 possessions with a chance to tie or take the lead in the second half that they couldn’t convert, but after a Lyles layup and steal they had one final opportunity. If there’s a moment anyone remembers from the Kansas State loss, it will probably be that desperate attempt to keep a possession alive late in the game. Lyles hustled back down court after his layup to pick the pocket of an unsuspecting K State player. Bringing the ball back up, exhausted, he collided with teammate Max Curran, the ball loose on the floor. Curran flipped it backward toward midcourt, where Academic All-American Joe Sherburne saved it from crossing the line for a violation, back to point guard K.J. Maura. The 5-foot-8 senior had the ball poked away by a defender, diving to the floor to save it again, every player giving up everything left in his body, as the ball eventually found its way back into the hands of Lyles. Lyles beat two defenders to the rim, but his shot was blocked. It would have cut the deficit to a single point — instead the Retrievers didn’t score again. Or rather, they didn’t until the final buzzer. The game out of reach, Odom pulled his starters to give them a chance to receive a proper ovation before it was all over, and for the end of the bench to get to tell their grandkids they played in an NCAA Tournament game without having to stretch the truth. One of those bench players rushing onto the floor was Isaiah Rogers, who wasn’t even in uniform last year — he was the team manager. Before that, like Lyles, he wasn’t even on campus, having started his college experience at St. Thomas University in Florida. Rogers took an internship in Maryland and was turned on to the school, eventually deciding to transfer without any guarantee of a basketball future. If you stick around the program and work hard every day, we may have a spot for you, he was told. That was enough for him. “I always felt that, especially with playing against them, I can definitely compete with these guys,” he told WTOP. After a year of long hours helping in and after practice, he earned that spot. With the final seconds ticking away in UMBC’s magical run, the game already lost, the only objective of the bench unit, including Rogers, was to try to get a good shot. When that shot missed, the ball found its way to Rogers, the last bit of time bleeding from the clock. He heard Odom, on the bench behind him, yell to get the ball. He grabbed it and let it fly, the ball falling through the net as the buzzer sounded. “I honestly didn’t even think that it had actually counted, because I saw the red light go on,” he said. Every kid dreams of hitting a buzzer-beater in the NCAA Tournament. This might not have been quite what Rogers envisioned as a kid on the blacktop, but it was hardly meaningless. It counted, trimming a nine-point loss to seven, inconsequential to the outcome and unnoticed by nearly everyone. But Rogers had only made it into three games all season, including this final one, and had only attempted one other shot, a missed three-pointer in a late-January home win over Maine. The shot was the first and only basket of his college career. Between Lyles’ buzzer-beater to get the Retrievers to the NCAA Tournament and Rogers’ final shot at the end of their run, there are stories of castoffs and underappreciated talent from the first to the last man on the roster. The history-making result, nobody could have seen coming. But perhaps Lyles put it best when defining how it all came together. A ticket rep didn’t have specific numbers, but said Tuesday that the season ticket holder base is unsurprisingly “up significantly” over last year. The team store, about the size of a studio apartment, has been reordering the stock of U Must Be Cinderella shirts every other day since they first came in. Someday, probably soon, that will stop. But 16 over 1 will exist forever, and will forever be UMBC’s to claim. There’s a saying printed on the wall inside the locker room at UMBC, one that, if Coach Odom has his way, will be displayed in a more prominent place soon: “The work that you do in the dark will reveal itself in the light.” After preparing in the shadows, UMBC was ready to step into the spotlight this March, even if nobody else was ready for them.